The fact that Cyprus has emerged as a possible scenario for Syria indicates that Turkey did not reflect enough on its history; the invasion of Cyprus did not solve the problem, but rather further complicated it. 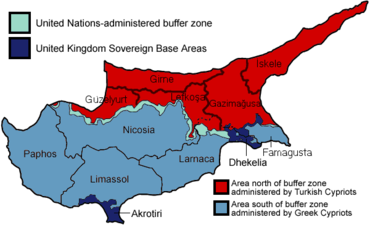 Leaving the Syrian factors aside, North Cyprus represents the worst possible scenario for Syria. I visited North Cyprus a few years ago, and though it was quiet and peaceful, it lacked economic development and infrastructure in comparison to the South. It relies entirely on Turkey, politically and economically, even in tourism – you have to fly to Turkey before heading to Kyriena (the biggest city in North Cyprus). Forty years after the Turkish invasion, North Cyprus remains in limbo; it has benefited neither from the booming economy of Turkey nor from the EU membership of the South. At least North Cyprus has some sort of a stable status quo, but this is unlikely to be achieved in the case of Syria. Any unilateral Turkish invasion that carves out part of Syria under Turkish patronage, but keeps the Assad regime in Damascus, may protect Turkish villages along the border but would not lead to stability within Syria – it would just initiate a new phase in the conflict. At best, it would create a massive wave of immigration of anti-Assad Syrians toward the Turkish control zone, leaving the Assad regime to solidify its control of the rest of the country and chase the free Syrian army militants within its territory. The worst-case scenarios are many: the continuation of fighting between the free Syrian army and the Assad regime with the Turkish army becoming directly involved, PKK operating inside Turkey from its Syrian bases – even if most Kurdish factions reach a deal with Turkey, the ones backed by Iran will not, as Cagaptay admitted in his piece. The PKK, however, would not be the only spoilers in town; Assad, Hezbollah, and Iran’s agents would also be around. A North Iraq option might not be easily secured, and Turkey might end up dragged into the deep end with Assad. In theory, intervention in Syria should be initiated by a coalition of forces – not Turkey alone – and with defined rules for each partner within this coalition for post-Assad Syria. However, the United Nations and its envoy Ibrahimi advocate de-escalation and a political solution. The true solution should be both – namely, a political solution that is pushed under the umbrella of a serious threat of military intervention. So far, Assad sees the international community as fractured and divided, so why should he compromise? On Friday, the Obama administration stated that the confiscation of a shipment of Russian-made equipment on its way to Damascus did not violate sanctions. This is not the attitude of an administration that is edging toward war. The frustration of Ankara might be received with sympathetic ears but not with a coordinated action plan from its allies. Whatever the plan Turkey has for the Syrian conundrum, it should include a clear exit strategy. How long would the Turkish army stay? Under what mandate and what responsibility? And what is the plan for the day after? Surely the image of George Bush with the slogan “mission accomplished” is still fresh in the minds of many in the Middle East. Turkey should learn from others’ mistakes. There are plenty of models on the table (Cyprus, Iraqi Kurdistan, Bosnia) and all share one outcome: division – or de-facto division– of the land. Not what Turkey should have for Syria. Therefore, if the international coalition fails to materialize, Turkey should continue what it is currently doing – low-intensity shelling and cross-border strikes – plus supporting the free Syrian army; it should resist the temptation to do more. Showing resolve is one thing; being dragged into open-ended adventure is another. Cagaptay admitted that the Cyprus scenario is the least desirable. That is not enough. In my opinion, it should be completely off the table. If Turkey cannot help Syria, it should at least cause no more harm. This entry was posted in Politics, Syria, Turkey and tagged #Syria, Cyprus, Turkey. Bookmark the permalink. The current focus is on Syria, but your mention of Cyprus and Turkey brings another issue of concern to mind: the contention over natural gas fields and the relations with Isreal. Greek Cyprus violated their own agreements with the North when they starting developing the Aphrodite field unilaterally, Turkey has already begun to intervene directly in disputed areas to the West of Cyprus, and Isreal is in talks to build a LNG facility in South Cyprus for those fields, depriving Turkey and No. Cyprus of related revenue. Does this relate to Turkey’s recent breaking of economic ties to Isreal and closer ties to Egypt? I have not heard Hugh Pope’s latest on this from the ICG Cyprus Project, but you are closer to this, so what do you think? These drivers know how to search for paphos car hire it’s not always the case. I would opt for the most commonly used mode of transportation, and one of the highest parts we visited. I assumed naively However, it is a great place to stay – all you have to go to other counties.